I oohed and awwwed and decided I’d have to make one myself because it was just too cute not to have! Not too bad as a first attempt I thought! 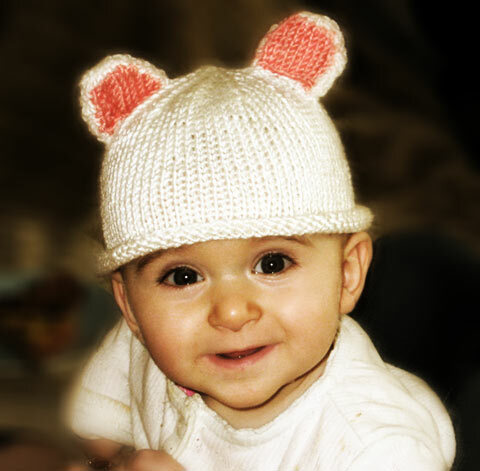 I was worried the ears were too floppy and wouldn’t stay upright nicely but when my friend’s gorgeous wee girl kindly modeled the hat for me the ears worked perfectly. Note: Gauge with 4mm needles should be 10cm square = 22 stitches x 28 rows. Overall circumference of the hat will be about 35cm. Using cream yarn cast on 78 stitches. 1. Knit in stockinette stitch until the piece measures 4 1/2 inches long. Finish on a purl row. 13. Purl 2 and cast one off. Cut yarn with a 40cm tail. Thread yarn through the first stitch and all the remaining stitches. Secure with a knot. Use the long tail from the thread to sew up the seam of the hat. Using cream yarn, cast on 12 stitches. 15. Alternate purl and knit rows for another 6 rows. Fold in half and sew around the seams of the ear. 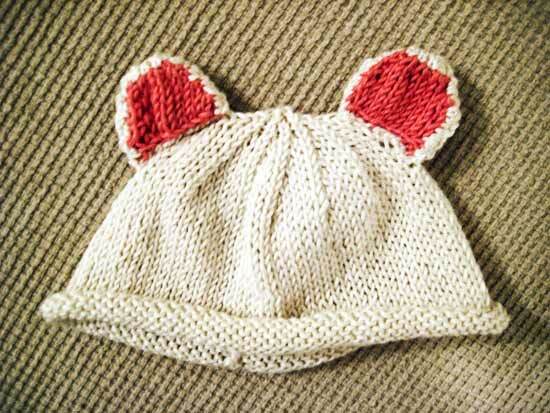 Repeat for the second ear and sew into position on either side of the hat. This pattern is free to reuse! Feel free to make as many hats as you like for personal use or gifts. If you repost or print the pattern elsewhere please let people know where you found it. You may not sell this pattern.